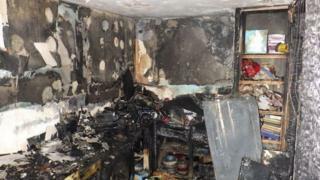 The government is not doing enough to protect consumers from faulty products that can cause fires, former BBC presenter Lynn Faulds-Wood has said. Ms Wood, whose comments come after the Grenfell Tower fire, said a review into product safety she carried out for the government had been ignored. She said she felt she had been offered an MBE last year, which she turned down, to “stop her nagging” officials. The government said it took consumer product safety “extremely seriously”. Ms Wood, who presented consumer affairs show Watchdog from 1985 to 1993, and who has long campaigned on consumer rights, was asked to look into the product recall system by the coalition government. It followed concerns the system was not working properly, leading to avoidable injuries, accidents, and even deaths. The review was published in February 2016, but Ms Wood said the government had not acted on any of its findings. Better data and information sharing by officials tasked with protecting the public. Speaking to Radio 5 Live’s Wake Up To Money, Ms Wood said following the review she was invited to meet a government minister who had not “read a word of it”. “I said, actually minister I have been invited along to talk to you about something I’ve spent the last nine months doing. Ms Wood said the UK was importing appliances from many more countries than it used to, and that while most would be safe, greater vigilance was needed against unscrupulous suppliers. She cited incidents including last year’s Shepherd’s Bush tower block fire, believed to have been caused by a faulty tumble dryer, as well blazes linked to Beko fridge freezers. She said Trading Standards departments in local authorities were struggling to police companies because of budget cuts, and businesses had become bolder about cutting corners. “We do not know what caused the Grenfell Tower fire, but what we do know is that we are putting people at risk because we don’t have a good enough system,” she said. A business department spokeswoman said a working group had been established in October 2016 to look at product recalls and safety “to ensure the products we all use are as safe as possible”. She said the group, led by fire safety expert Neil Gibbins, was exploring Ms Faulds Wood’s recommendations and “developing options” for improvement. She added that the group had commissioned the British Standards Institute to develop a code of practice on recalls.